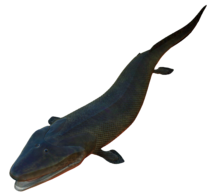 Tiktaalik (/tɪkˈtɑːlɪk/; syllabics ᑎᒃᑖᓕᒃ) is a monospecific genus of extinct sarcopterygian (lobe-finned fish) from the Late Devonian Period, about 375 Ma (million years ago), having many features akin to those of tetrapods (four-legged animals). Unearthed in Arctic Canada, Tiktaalik is technically a fish, complete with scales and gills - but it has the flattened head of a crocodile and unusual fins. Its fins have thin ray bones for paddling like most fishes', but they also have sturdy interior bones that would have allowed Tiktaalik to prop itself up in shallow water and use its limbs for support as most four-legged animals do. Those fins and a suite of other characteristics set Tiktaalik apart as something special; it has a combination of features that show the evolutionary transition between swimming fish and their descendants, the four-legged vertebrates - a clade which includes amphibians, reptiles, birds and mammals. It and similar animals may possibly be the common ancestors of the broad swath of all vertebrate terrestrial fauna: amphibians, reptiles, birds, and mammals. The first well-preserved Tiktaalik fossils were found in 2004 on Ellesmere Island in Nunavut, Canada. Tiktaalik provides insights on the features of the extinct closest relatives of the tetrapods. Unlike many previous, more fishlike transitional fossils, the "fins" of Tiktaalik have basic wrist bones and simple rays reminiscent of fingers. The homology of distal elements is uncertain; there have been suggestions that they are homologous to digits, although this is incompatible with the digital arch developmental model because digits are supposed to be postaxial structures, and only three of the (reconstructed) eight rays of Tiktaalik are postaxial. However, the proximal series can be directly compared to the ulnare and intermedium of tetrapods. The fin was clearly weight bearing, being attached to a massive shoulder with expanded scapular and coracoid elements and attached to the body armor, large muscular scars on the ventral surface of the humerus, and highly mobile distal joints. The bones of the forefins show large muscle facets, suggesting that the fin was both muscular and had the ability to flex like a wrist joint. These wrist-like features would have helped anchor the creature to the bottom in fast moving current. The alligator gar is an extant fish that bears some resemblance to Tiktaalik. Also notable are the spiracles on the top of the head, which suggest the creature had primitive lungs as well as gills. This attribute would have been useful in shallow water, where higher water temperature would lower oxygen content. This development may have led to the evolution of a more robust ribcage, a key evolutionary trait of land-living creatures. The more robust ribcage of Tiktaalik would have helped support the animal's body any time it ventured outside a fully aquatic habitat. Tiktaalik also lacked a characteristic that most fishes have—bony plates in the gill area that restrict lateral head movement. This makes Tiktaalik the earliest known fish to have a neck, with the pectoral girdle separate from the skull. This would give the creature more freedom in hunting prey either on land or in the shallows. We're making the hypothesis that this animal was specialized for living in shallow stream systems, perhaps swampy habitats, perhaps even to some of the ponds. And maybe occasionally, using its very specialized fins, for moving up overland. And that's what is particularly important here. The animal is developing features which will eventually allow animals to exploit land. Descendants also included pelagic lobe-finned fish such as coelacanth species. In 2000 P. Ahlberg et al. described a transitional form from fish to tetrapod, Livoniana. This creature dates 374 - 391 million years ago, a successor to Panderichthys. 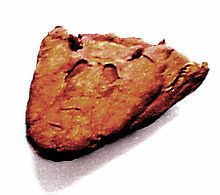 Tiktaalik roseae is the only species classified under the genus. Tiktaalik lived approximately 375 million years ago. It is representative of the transition between non-tetrapod vertebrates (fish) such as Panderichthys, known from fossils 380 million years old, and early tetrapods such as Acanthostega and Ichthyostega, known from fossils about 365 million years old. Its mixture of primitive fish and derived tetrapod characteristics led one of its discoverers, Neil Shubin, to characterize Tiktaalik as a "fishapod". The phylogenetic analysis by Daeschler et al. placed Tiktaalik as a sister taxon to Elpistostege and directly above Panderichthys preceded by Eusthenopteron. Tiktaalik was thus inserted below Acanthostega and Ichthyostega as a transitional form and a true "missing link". Such order of the phylogenetic tree was initially adopted by other experts, most notably by Per Ahlberg and Jennifer Clack. However, it was questioned in a 2008 paper by Boisvert at al. who noted that Panderichthys, due to its more derived distal portion, might be closer to tetrapods than Tiktaalik or even that it was convergent with tetrapods. Ahlberg, co-author of the study, considered the possibility of Tiktaalik's fin having been "an evolutionary return to a more primitive form." various size footprints with some unusually big (up to 26 cm wide) indicating body lengths of over 2.5 m.
Track-bearing layers were assigned to the lower-middle Eifelian based on conodont index fossil samples (costatus Zone) and "previous biostratigraphic data obtained from the underlying and overlying strata" with subsequent studies confirming this dating. Zachełmie trackmakers predate not only ichthyostegids and elpistostegids (including Tiktaalik) but also a number of tetrapodomorph fish which until 2010 were unanimously considered ancestors of tetrapods. Both Tiktaalik's discoverers were skeptical about the Zachelmie trackways. Edward Daeschler said that trace evidence was not enough for him to modify the theory of tetrapod evolution, while Neil Shubin argued that Tiktaalik could have produced very similar footprints (in a later study Shubin expressed a significantly modified opinion that some of the Zachelmie footprints, those which lacked digits, may have been made by walking fish). However, Ahlberg insisted that those tracks could not have possibly been formed either by natural processes or by transitional species such as Tiktaalik or Panderichthys. Instead, the authors of the publication suggested ichthyostegalians as trackmakers, based on available pes morphology of those animals. However, a paper published in 2015 that undertook a critical review of Devonian tetrapod footprints called into question the designation of the Zachelmie marks and instead suggested an origin as fish nests/feeding traces. An earlier study in 2012 indicated that Zachelmie trackmakers were even more advanced than Ichthyostega in terms of quadrupedalism. Grzegorz Niedźwiedzki's reconstruction of one of the trackmakers was identical to that of Tulerpeton. they were a result of convergent or parallel evolution so that apomorphies and striking anatomical similarities found in both digited tetrapods and elpistostegalians evolved at least twice. It should be noted that convergency is considered responsible for uniquely tetrapod features found also in other non-elpistostegalian fish from the period like Sauripterus (finger-like jointed distal radial bones) or Tarrasius (tetrapod-like spine with 5 axial regions). Estimates published after the discovery of Zachelmie tracks suggested that digited tetrapods may have appeared as early as 427.4 Ma ago and questioned attempts to read absolute timing of evolutionary events in early tetrapod evolution from stratigraphy. Until more data become available, the phylogenetic position of Tiktaalik and other elpistostegids remains uncertain. Discovery site of Tiktaalik fossils. In 2004, three fossilized Tiktaalik skeletons were discovered in rock formed from late Devonian river sediments on Ellesmere Island, Nunavut, in northern Canada. Estimated ages reported at 375 MYA, 379 MYA, and 383 MYA. At the time of the species' existence, Ellesmere Island was part of the continent Laurentia (modern eastern North America and Greenland), which was centered on the equator and had a warm climate. When discovered, one of the skulls was found sticking out of a cliff. Upon further inspection, the fossil was found to be in excellent condition for a 375-million-year-old specimen. The discovery, made by Edward B. Daeschler of the Academy of Natural Sciences, Neil H. Shubin from the University of Chicago, and Harvard University Professor Farish A. Jenkins, Jr, was published in the April 6, 2006, issue of Nature and quickly recognized as a transitional form. Jennifer A. Clack, a Cambridge University expert on tetrapod evolution, said of Tiktaalik, "It's one of those things you can point to and say, 'I told you this would exist,' and there it is." After five years of digging on Ellesmere Island, in the far north of Nunavut, they hit pay dirt: a collection of several fish so beautifully preserved that their skeletons were still intact. As Shubin's team studied the species they saw to their excitement that it was exactly the missing intermediate they were looking for. 'We found something that really split the difference right down the middle,' says Daeschler. The name Tiktaalik is an Inuktitut word meaning "large freshwater fish". The "fishapod" genus received this name after a suggestion by Inuit elders of Canada's Nunavut Territory, where the fossil was discovered. The specific name roseae cryptically honours an anonymous donor. Taking a detailed look at the internal head skeleton of Tiktaalik roseae, in the October 16, 2008, issue of Nature, researchers show how Tiktaalik was gaining structures that could allow it to support itself on solid ground and breathe air, a key intermediate step in the transformation of the skull that accompanied the shift to life on land by our distant ancestors. ^ a b Shubin, Neil (2008). Your Inner Fish: A Journey into the 3.5-Billion-Year History of the Human Body. New York: University of Chicago Press. ISBN 9780375424472. ^ Laurin M (2006). "Scanty evidence and changing opinions about evolving appendages". Zoologica Scripta. 35 (6): 667–668. doi:10.1111/zsc.2006.35.issue-6. ^ a b c d Shubin, Neil (2008). Your Inner Fish. Pantheon. ISBN 978-0-375-42447-2. ^ a b c Holmes, Bob (2007). "Meet Your ancestor, the Fish that crawled". New Scientist. Retrieved 2007-02-07. ^ a b Jennifer A. Clack, Scientific American, Getting a Leg Up on Land Nov. 21, 2005. ^ Spitzer, Mark (2010). Season of the Gar: Adventures in Pursuit of America's Most Misunderstood Fish. University of Arkansas Press. pp. 65–66. ISBN 978-1-55728-929-2. ^ "Fossil Suggests Missing Link From Fish to Land". NPR (National Public Radio). Retrieved 2006-11-27. ^ "Primitive fish could nod but not shake its head: Ancient fossils reveal surprises about early vertebrate necks, abdominal muscles". Science News. June 13, 2013. ^ Sam Van Wassenbergh; Anthony Herrel; Dominique Adriaens; Frank Huysentruyt; Stijn Devaere & Peter Aerts (13 April 2006). "Evolution: A catfish that can strike its prey on land". Nature. 440 (7086): 881. Bibcode:2006Natur.440..881V. doi:10.1038/440881a. PMID 16612372. ^ "The fish that crawled out of the water". Nature. Retrieved 2006-04-06. ^ Shubin, N. H.; Daeschler, E. B.; Jenkins, F. A. (2014). "Pelvic girdle and fin of Tiktaalik roseae". Proceedings of the National Academy of Sciences. 111 (3): 893–899. Bibcode:2014PNAS..111..893S. doi:10.1073/pnas.1322559111. PMC 3903263. PMID 24449831. ^ a b Peterson, Britt (April 5, 2006). "An Evolutionary Finding". Seed. Retrieved 2006-04-05. ^ NewsHour, Fossil Discovery, April 6, 2006. ^ John Noble Wilford, The New York Times, Scientists Call Fish Fossil the Missing Link, Apr. 5, 2006. ^ Daeschler, Edward B.; Shubin, Neil H.; Jenkins, Farish A., Jr (6 April 2006). "A Devonian tetrapod-like fish and the evolution of the tetrapod body plan" (PDF). Nature. 440 (7085): 757–763. Bibcode:2006Natur.440..757D. doi:10.1038/nature04639. PMID 16598249. ^ Rex Dalton (5 April 2006). "The fish that crawled out of the water". Nature. doi:10.1038/news060403-7. ^ Ahlberg, Per Erik; Clack, Jennifer A. (6 April 2006). "A firm step from water to land". Nature. 440 (7085): 747–749. Bibcode:2006Natur.440..747A. doi:10.1038/440747a. PMID 16598240. ^ Boisvert, Catherine A.; Mark-Kurik, Elga; Ahlberg, Per E. (4 December 2008). "The pectoral fin of Panderichthys and the origin of digits". Nature. 456 (7222): 636–638. Bibcode:2008Natur.456..636B. doi:10.1038/nature07339. PMID 18806778. Given that recent phylogenies consistently place Panderichthys below Tiktaalik in the tetrapod stem group, it is surprising to discover that its pectoral fin skeleton is more limb-like than that of its supposedly more derived relative. [...] It is difficult to say whether this character distribution implies that Tiktaalik is autapomorphic, that Panderichthys and tetrapods are convergent, or that Panderichthys is closer to tetrapods than Tiktaalik. ^ Ker Than (September 24, 2008). "Ancient Fish Had Primitive Fingers, Toes". National Geographic News. National Geographic Society. Archived from the original on September 27, 2008. Curiously, the radial bones of Panderichthys are more finger-like than those of Tiktaalik, a fish with stubby leg-like limbs that lived about five million years later. Many scientists regard Tiktaalik as a "missing link": the crucial transitional animal between fish and the first tetrapods. One possibility, Ahlberg said, is that finger development took a step backward with Tiktaalik, and that Tiktaalik's fins represented an evolutionary return to a more primitive form. ^ a b c d e Niedźwiedzki, Grzegorz; Szrek, Piotr; Narkiewicz, Katarzyna; Narkiewicz, Marek; Ahlberg, Per E. (7 January 2010). "Tetrapod trackways from the early Middle Devonian Period of Poland". Nature. 463 (7277): 43–48. Bibcode:2010Natur.463...43N. doi:10.1038/nature08623. PMID 20054388. ^ Niedźwiedzki, Grzegorz; Szrek, Piotr; Narkiewicz, Katarzyna; Narkiewicz, Marek; Ahlberg, Per E. (2010). "Tetrapod trackways from the early Middle Devonian Period of Poland. Supplementary information". Nature. 463 (7277): 43–8. Bibcode:2010Natur.463...43N. doi:10.1038/nature08623. PMID 20054388. ^ Walking with tetrapods. Nature. January 6, 2010. Archived from the original (FLV) on December 20, 2014. ^ Jonathan Amos (6 January 2010). "Fossil tracks record 'oldest land-walkers'". BBC. Archived from the original on January 7, 2010. ^ Narkiewicz, Katarzyna; Narkiewicz, Marek (1 March 2010). "Mid Devonian carbonate platform development in the Holy Cross Mts. area (central Poland): new constraints from the conodont Bipennatus fauna". Neues Jahrbuch für Geologie und Paläontologie - Abhandlungen. 255 (3): 287–300. doi:10.1127/0077-7749/2009/0025. ^ Niedźwiedzki, Grzegorz; Narkiewicz, Marek; Szrek, Piotr (2014). "The age of the oldest tetrapod tracks from Zachełmie, Poland". Bulletin of Geosciences. 89 (3): 593–606. ^ Narkiewicz, Katarzyna; Narkiewicz, Marek (January 2015). "Middle Devonian invertebrate trace fossils from the marginal marine carbonates of the Zachełmie tetrapod tracksite, Holy Cross Mountains, Poland". Lethaia. 48 (1): 10–12. doi:10.1111/let.12083. ^ "Trace evidence is not enough for me to change my mind about accepted theories on tetrapod evolution" - Edward Daeschler as quoted in Rex Dalton (January 6, 2010). "Discovery pushes back date of first four-legged animal". Nature. doi:10.1038/news.2010.1. Archived from the original on March 8, 2014. "I am not ready to discard the established paradigm for the fish-tetrapod transition" - Edward Daeschler as quoted in Jef Akst (January 6, 2010). "Tetrapods' old age revealed". The Scientist. "With all respect to the scientists involved in this study, there may be other explanations for these suggestive tracks." - Edward Daeschler as quoted in Dan Vergano (January 6, 2010). "Four-legged finding muddies paleontological waters". USA Today. Archived from the original on December 24, 2014. ^ [Neil Shubin] says that a model of Tiktaalik's skeleton would produce a print much like the one in the paper if it's mushed into sand, and different consistencies or angles would produce an even closer match. He adds, "There is nothing in Tiktaalik’s described anatomy that suggests it didn’t have a stride." in Ed Yong (January 6, 2010). "Fossil tracks push back the invasion of land by 18 million years". Discover. Archived from the original on May 16, 2010. ^ King, Heather M.; Shubin, Neil H.; Coates, Michael I.; Hale, Melina E. (December 27, 2011). "Behavioral evidence for the evolution of walking and bounding before terrestriality in sarcopterygian fishes". PNAS. 108 (52): 21146–21151. Bibcode:2011PNAS..10821146K. doi:10.1073/pnas.1118669109. PMC 3248479. PMID 22160688. It follows that the attribution of some of the nondigited Devonian fossil trackways to limbed tetrapods may need to be revisited. ^ "You can see anatomical details consistent with a footprint, including sediments displaced by a foot coming down", "There is no way these could be formed by a natural process." - Per Ahlberg as quoted in Rex Dalton (January 6, 2010). "Discovery pushes back date of first four-legged animal". Nature. doi:10.1038/news.2010.1. Archived from the original on March 8, 2014. ^ Lucas, Spencer G. (2015). "Thinopus and a Critical Review of Devonian Tetrapod Footprints" (PDF). Ichnos. 22 (3–4): 136–154. doi:10.1080/10420940.2015.1063491. ^ Pierce, Stephanie E.; Clack, Jennifer A.; Hutchinson, John R. (28 June 2012). "Three-dimensional limb joint mobility in the early tetrapod Ichthyostega" (PDF). Nature. 486 (7404): 523–526. Bibcode:2012Natur.486..523P. doi:10.1038/nature11124. PMID 22722854. ^ a b Niedźwiedzki, Grzegorz; Szrek, Piotr (2010). "Way to Go!" (PDF). Academia. 2 (26): 28–31. ISSN 1731-7401. OCLC 786293607. Archived from the original (PDF) on January 19, 2015. ^ The 2007 artistic restoration of Tulerpeton by Dmitry Bogdanov available at Wikimedia is virtually identical to the 2008 rendering of a Zachelmie trackmaker by Grzegorz Niedźwiedzki. ^ W.Ż. (February 4, 2010). "A Creature That Time Forgot". The Warsaw Voice. Warsaw. Archived from the original on December 22, 2014. ; "W Polsce odkryto ślady najstarszych kopalnych czworonogów" [Oldest tetrapod fossil footprints discovered in Poland]. Science & Scholarship in Poland (Polish Press Agency) (in Polish). Warsaw. January 7, 2010. Archived from the original on December 22, 2014. ^ "We now have to invent a common ancestor to the tetrapods and elpistostegids." - Philippe Janvier as quoted in Karen McVeigh (January 6, 2010). "Footprints show tetrapods walked on land 18m years earlier than thought". The Guardian. London. Archived from the original on March 2, 2014. ^ "Ancient Four-Legged Beasts Leave Their Mark". Science. 6 January 2010. Archived from the original on September 30, 2013. ^ Janvier, Philippe; Clément, Gaël (7 January 2010). "Muddy tetrapod origins". Nature. 463 (7277): 40–41. Bibcode:2010Natur.463...40J. doi:10.1038/463040a. PMID 20054387. ^ a b Friedman, Matt; Brazeau, Martin D. (7 February 2011). "Sequences, stratigraphy and scenarios: what can we say about the fossil record of the earliest tetrapods?". Proceedings of the Royal Society B. 278 (1704): 432–439. doi:10.1098/rspb.2010.1321. PMC 3013411. PMID 20739322. Archived from the original on December 22, 2014. ^ Gee, Henry (January 6, 2010). "First Footing". SciLogs. Archived from the original on December 22, 2014. It is possible that the close similarity between elpistostegids and tetrapods might have been the result of evolutionary convergence. The common ancestor of elpistostegids and tetrapods wouldn't have to have looked like Tiktaalik – it could have been a more undifferentiated, tetrapodomorph fish. Elpistostegids and tetrapodomorphs, each following their own paths, grew to look more and more like one other. ^ Daeschler, Edward B.; Shubin, Neil (8 January 1998). "Fish with fingers?". Nature. 391 (6663): 133. Bibcode:1998Natur.391..133D. doi:10.1038/34317. ^ Davis, Marcus C.; Shubin, Neil; Daeschler, Edward B. (2004). "A new specimen of Sauripterus taylori (Sarcopterygii, Osteichthyes) from the Famennian Catskill Formation of North America". Journal of Vertebrate Paleontology. 24 (1): 26–40. doi:10.1671/1920-3. ^ Sallan, Lauren Cole (22 August 2012). "Tetrapod-like axial regionalization in an early ray-finned fish" (PDF). Proceedings of the Royal Society B. 279 (1741): 3264–3271. doi:10.1098/rspb.2012.0784. PMC 3385743. PMID 22628471. Archived from the original (PDF) on January 3, 2015. ^ Gorner, Peter (2006-04-05). "Fossil could be fish-to-land link". Chicago Tribune. ^ Easton, John (2008-10-23). "Tiktaalik's internal anatomy explains evolutionary shift from water to land". University of Chicago Chronicle. University of Chicago. 28 (3). Retrieved 2009-07-19. ^ a b Spotts, Peter (April 6, 2006). "Fossil fills gap in move from sea to land". The Christian Science Monitor. Retrieved 2006-04-05. ^ Holmes, Bob (5 April 2006). "First fossil of fish that crawled onto land discovered". New Scientist News. Retrieved 2006-04-07. ^ Coyne, Jerry (2009). Why Evolution is True. Viking. ISBN 978-0-670-02053-9. Wikimedia Commons has media related to Tiktaalik. Interview with Neil Shubin on The Inoculated Mind, February 12, 2008. Interview with Neil Shubin on Tech Nation where he discusses the discovery of the Tiktaalik, February 14, 2008. Fishapod stars in music video, YouTube. Accessed on December 27, 2008.